I attended the Georg Jensen Fusion Showpiece Collection event with Avril Graham, Harper's BAZAAR Executive Fashion & Beauty Editor. 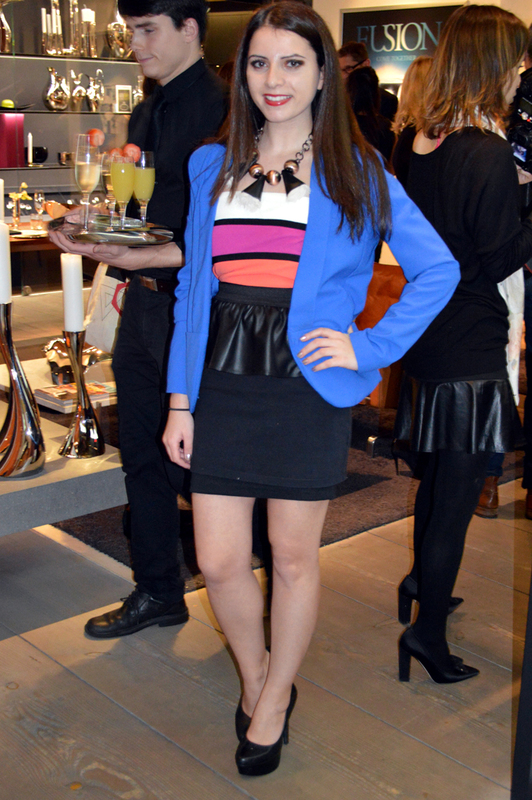 The event was held at the Georg Jensen boutique located right on Madison Ave in NYC’s famous Upper East Side. I’m a big fan of Georg Jensen jewelry and was really excited to meet Fashion Editor and icon Avril Graham. I was all ready to go when the promised Nor'easter hit NYC in full force of snow. While most people were running home I decided that this event was not something I could possibly miss. When I finally made it to the Georg Jensen boutique I was greeted with champagne and hors d'oeuvres. It was quite a nice welcome after just trekking through a snowstorm in heels! Next, I met James Crespo, the US President of Georg Jensen who showed me how to design my own Georg Jensen Fusion ring. The idea of the Fusion collection is three pieces that you put together to create your own design. The rings themselves are 3 pieces of a puzzle. They’re like a love story that you combine to create what you like. 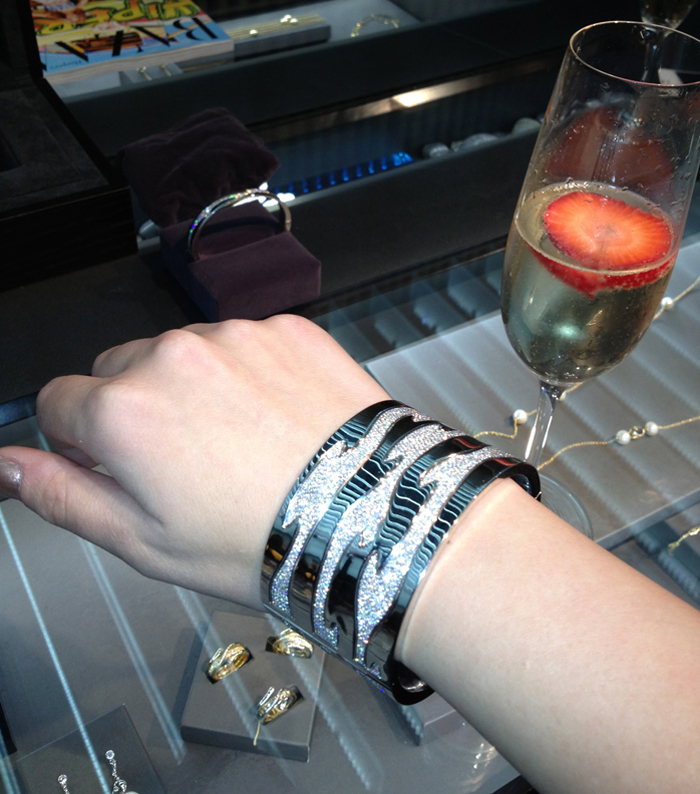 It was so much fun to create the fusion cuff in the store as all you had to do was swipe your hand to select the pieces. You can also create the custom cuff online at www.georgjensen.com. When all the guests finally arrived James and Avril talked more about the Fusion collection. James mentioned how they wanted to create something central to the Georg Jensen heritage but that was also a statement piece. He spoke about how each of these rare and beautiful pieces takes around 500 hours of hand crafted work to make. Avril brought up famous editor Diana Vreeland and how she used to wear the same cuff on each wrist which you can easily achieve with the Georg Jensen collection. After the presentation I had a chance to meet and interview Avril Graham about the new Georg Jensen Fusion Collection. What would you say was your favorite piece? I know it’s really hard to choose but what would you personally love to wear? Avril: When you come to Georg Jensen it’s really difficult to choose one piece. If I was choosing to style a page for a magazine and it had to be something a little more elaborate. I love the idea of this large (fusion) cuff if it was Beyonce, Rihanna or Helen Mirren. It’s really women across all age groups. This I think is a gorgeous piece. It would look amazing with a little black dress, a black roll neck sweater or a crisp white shirt. It just goes with everything. This is an example of excusite workmanship from Georg Jensen. If a woman was going to a black-tie event what kind of a dress would you recommend to wear with such amazing jewelry from Georg Jensen. Avril: When you’re wearing a Georg Jensen piece it tends to be more sculptural. I would not go for an elaborate silhouette. I’m thinking along the lines of that wonderful white Tom Ford dress that Gwyneth Paltrow wore. That would look amazing with a Georg Jensen piece. What kind of celebrities do you see wearing the collection? I mentioned Gwyneth. I think she’s a really good choice. Finally, I couldn't resist trying on one of the fusion cuffs. The moment I put it on I felt like royalty as the diamonds shined with such breathtaking brilliance. Wearing a Georg Jensen fusion piece was such a euphoric fairy tale experience that I'll certainly never forget. What an awesome evening. I would enjoy going to an event like that - Richmond has smaller events that are special but nothing as unique as Georg Jensen!